Cree XL-M RGBW LED - recommended LED driver? I live in Australia and am new to the electronics world. 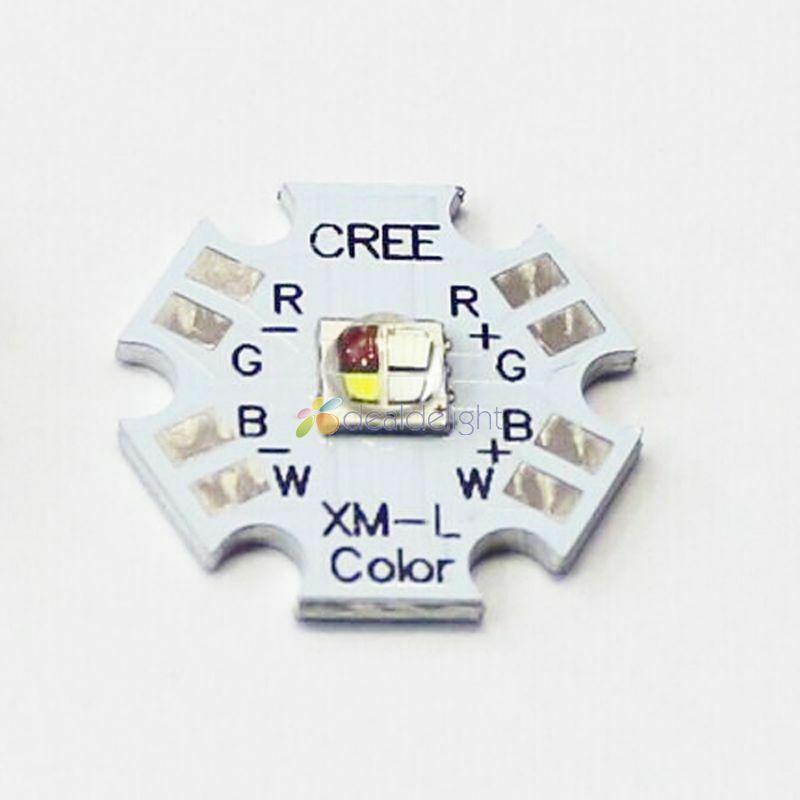 I recently obtained a Cree XM-L RGBW LED 20mm 12W (image). I want to wire it up, so decided to browse the internet for wiring information. This has resulted in a multitude of questions and I haven't been able to find any answers. From what I can gather, each LED runs @ 100% ~350 mA, up to a maximum of 1 A. Doing some research, it seems I should use an LED driver to ensure that a consistent voltage is maintained. I have some LM317T MOSFET/Voltage regulators coming in, but after some further reading, they can be inefficient. I read I can use an Arduino for PWM to help set different colours by varying the brightness of each LED. Can the Arduino also be used as a driver? Looking for a driver is where I'm stumped. I'm assuming I need a driver per LED. Does this mean I need 4 separate drivers or are 4 channel drivers available? I've seen some single-chip IC drivers and some larger (multiple component) drivers, which should I be looking for? I would have thought that drivers for this type of multiple LED would be easily found, but I'm stuck :) Maybe I'm searching for the wrong thing? I emailed Cree, but they simply gave me an email address for an Australian LED company that no longer exists (at least the domain is no longer active). So I thought the next best bet would be reaching out to users who may have dealt with these LEDs. You can use a RGB strip driver module. They are dirt cheap and come with a IR remote on Ebay. These provide a max output of 12V as they are meant for this voltage. Most can handle up to 2A per channel, so more than what you need. All YOU need as to add a suitable resistor to each color of your LED. The datasheet should tell you the pricese values for each color and you can use an online LED calculator (or your own) to get the right resistor value for 12V. Assuming all colors have the same max then a 36 Ohm resistor with 5W should keep you safe. If you look for RGBW drivers, you can probably find something that will work. LEDs need constant CURRENT for safe operation, not voltage. Your maximum current is 350mA. Try looking for 4 channel constant current LED drivers as a search term.